Desktop Publishing can be a bit intimidating when you are first starting out. There’s quite a lot to learn and the initial investment for the industry standard publishing software can definitely set you back a bit. Well here’s a bit of good news for those contemplating whether or not to take the plunge. There are a host of free and open source programs out there that can allow you to get the job done without having to pay a cent. 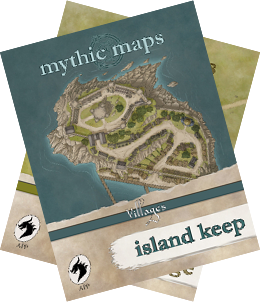 This post offers a walk-through on how to create map-packs like the one’s I’m selling over at DriveThruRpg with free and freeware software. Allow me to say up front that this walk-through owes much to Jonathan Roberts tutorial over at Fantastic Maps. Jonathan’s tutorial however utilizes Acrobat Pro. For those of you who already own this software I’d direct you to his tutorial. For those that don’t and want to save a buck, feel free to read on. SmallPdf – a free online pdf editor. There are a host of free and open source graphics programs available for creating the maps and graphic images you’ll need for the map pack. GIMP is a good raster program that can serve as an alternative to Photoshop. If you want to do a lot of line work, Inkscape is a vector program that can substitute for Illustrator. If you are interested in a paint program, MyPaint and Krita are both great options. Note: I won’t cover the “how” part of creating maps in this post (though you can find some of my map creation walkthroughs here), but rather going over the steps I take in compiling a map-pack. I begin by creating a document in my graphics program set to 2550×3508 px and (300dpi). This will be large enough for me to crop the image to either a U.S. letter page format, or an A4 format. I then create a colored map complete with labels but save four version of this map: the colored and labeled version; a colored non-labeled version; a B&W labeled version; a B&W non-labeled version. I create the other graphics used in the map pack, including the publishers logo, the product-line logo, the front page, an interior “credits” page, and a back page which advertises other products I’m selling. Save the file to the appropriate folder. Download and extract the .jpgs to the appropriate folder. Cover Page – offers a preview of the map, the name of the product and product line, and has my publisher’s logo on it. Credits Page – contains the (private use) map license, publisher info, credits, and an explanation of the product and how to use it. Back Page – advertises other products I’m selling. Create document – fire up Scribus and select the default single page option, your paper size, and the number of pages you’ll need for the document (if you’re not sure, just pick a number, you can always add or subtract pages later on). Click “OK”. Create Layer Stack – Scribus works with layers much the way that a graphics program does. This allows you to keep the text, image and background layers all separate from each other. You’ll need to set this up before you add any content. On the top-hand menu click on the “Window”s tab and on the drop-down menu select “Layers”. In the Layers window click on the + button to add a new layer and title it “Images” Also, create a new layer called “Bookmarks”. Making sure that you are working on the image layer, click on the “Insert” tab on the top menu and select “Insert Image Frame” (or just use the Insert Image Frame tool located toward the center left of the top-hand toolbar). Left-click anywhere in the image and drag the mouse toward the bottom right of the page. You should see a red box with a black cross through it. This is the image frame and you use it to load images. However the image will only extend the length and width of the frame. We want this to cover the entire page so we’ll need to re-size the frame to accommodate this. To change the position of the frame, open the Properties Manager (go to “Windows” and on the drop down menu select “Properties”. The properties window has several tabs. Click on the “X,Y,Z” tab at the top. Set the X-Pos and Y-Pos both to 0. In the width field type in the word “pagewidth”, and in the height field type in “pageheight” and hit enter. The frame should now cover the entire page. To upload an image double-click inside the Image Frame (this will pull up your files and you can navigate to the image you want). Repeat this process for each page, adding your cover page, credits page, map images and back page (should you include one). If you need to add or subtract pages, you can do so by going to the “Page” tab of the top menu and clicking on “Insert” or “Delete”. Add Bookmarks: DriveThruRPG recommends doing this for all ebooks. This is a bit of an awkward procedure in Scribus because it turns out you can only add bookmarks to text frames, which is… weird. So then if you are only working with image frames how do you add bookmarks? The answer is, you can’t (as far as I know anyway). You have to create a text-frame for each page that you want a bookmark. So let’s go ahead and talk about how to do this. Go to the “Windows” tab and click on “Bookmarks” to bring of the bookmark palette. This will give you a preview of how your bookmarks will be arranged. Next, click on the “Bookmarks” layer in your Layer’s dialogue to ensure that we are working on the correct layer. Now we are going to type in text using the “Insert Text Frame” in the drop-down menu of the “Insert” tab. Double click on this frame and then type in the name of the page as you would like it to appear in the bookmarks. Next, right click on this text box and in the drop-down menu that appears, navigate to “PDF Options” and click on “Is PDF Bookmark”. The bookmark should now show up in the Boomarks dialogue. Repeat this process for each new page that you wish to book-mark. Now we are presented with a problem. The bookmarked text is obscuring our pretty images. As a possible solution I tried setting the opacity of the Text to “0”, but when I created the pdf the text still showed up in white. So then I tried something else. I simply moved the “Bookmarks” layer down a level (using the green down arrow on the Layers dialogue) below the image layer where the text would be well hidden. That did the trick. Export File as PDF: now that the ebook is assembled we want to save it as a pdf suitable for viewing on a monitor. DriveThruRPG has certain specifications that they require publishers to adhere to so I’ll include these below. Under the “Color” tab make sure that the “Output Intended For” drop-down menu is set to Screen/Web. Under the “Pre-Press” tab, make sure that the document bleed is set to 0. Finally, click save to export the PDF. DriveThruRPG requires that all pdf ebooks be optimized for web and device viewing. Optimization compresses and dramatically reduces the pdf file size. This can be done with SmallPDF. Navigate to their website and click on the “Compress PDF” link. Drag and drop your PDF file into the upload window. Once the compression is done, download and unzip your optimized PDF file. That’s it, you’re all done! Hope this was helpful.